Bikes, my favorite mode of transport. To be honest, I have yet to fully embrace the bicycle as my primary vehicle. A few factors play into that. One, like most things bikes are expensive here, even second hand. Two, if I’m going to ride almost every trip I require at least a decent level of performance, meaning I won’t settle for a clunker scraped together from the parts bin. Lastly, public transportation is so cheap, easy and comfortable is it difficult to give up. But like many things, making a smooth transition is important to long-term acceptance. I’ve already made the move from car to public transport, and by the end of our stay here I hope to be a full-fledged cycling commuter. 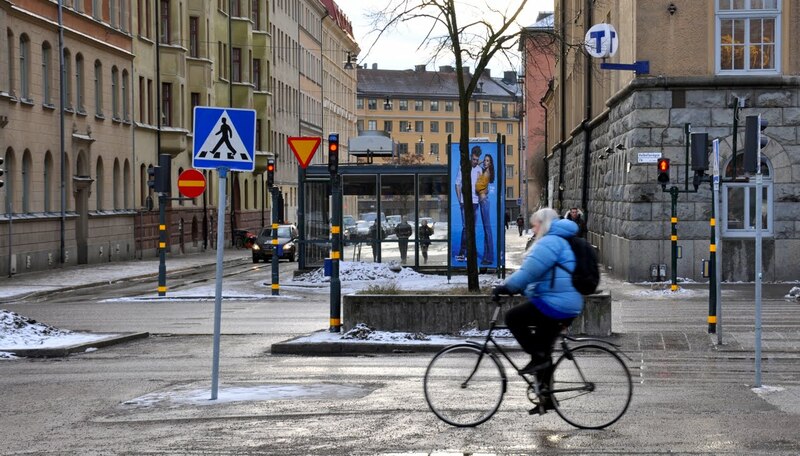 For the first few months here I was able to participate in Stockholm’s city bike program. (If you are unfamiliar with bike sharing programs, see the explanation in my first installment). When I was considering transportation options, using public transport combined with the city bikes was the most cost-effective option. Any used bikes I found that I liked were $600 to $1100, and that didn’t always include fenders and a rack. $800 gets me public transportation for the entire school year, so I knew that if I was to get a bike for commuting I would have to make it my exclusive choice for travel. Being a relative rookie when it comes to commuting I was nervous about my dedication, especially with my first Swedish winter approaching. Paying less than $30 to use the city’s bikes sounded like a much better option. Bike sharing is a great concept and is quite popular in Stockholm, but I haven’t always been so excited to grab a bike. I always have three concerns when checking one out: getting a newer model that fits me, having air in the tires, and finding gears that work. There are two generations of bikes, and only the newer ones come close to fitting my lanky 6-foot-4 frame. Sometimes, there might only be one newer bike in the rack, and I have to spend several minutes checking in and out all the other bikes to get it. Once I get the right frame, I have to check the tires for adequate air. I only made the mistake of neglecting this early on. Most of the city bike tires were low on air, which I didn’t realize until October when they got a top-up and then I noticed how much faster they were. When tire pressure is deemed acceptable, that's when I’ll take the bike. Once riding, you quickly learn how many usable gears you have, which most of the time is two, in any combination. All city bikes are equipped with 3-speed internally geared hubs, but most have been abused to the point where two and sometimes only one gear still work. For some trips this is a non-issue, but for the moderately hilly, 4 km ride to campus, it is nice to have some gears so I don’t get too sweaty for class. So while all of these things are relatively minor on their own, combined it makes selecting city bikes over public transportation somewhat difficult. But hey, it's only $30, right? Certainly, the city bikes have their place. For quick errands during the day they are hard to beat. Depending on where in the city you are going, they can be significantly faster than buses or trains. And if the weather is nice in the morning, but then rains in the afternoon (which it did A LOT this fall) it's nice not to have your own bike to deal with. But ultimately they are built to be generically utilitarian and thus not much fun to ride. I do plan to sign up for the program again next summer because it can be very convenient and is so cheap, but I can’t say I’m looking forward to throwing a leg over those blue beasts. But there is the chance next year will be different. 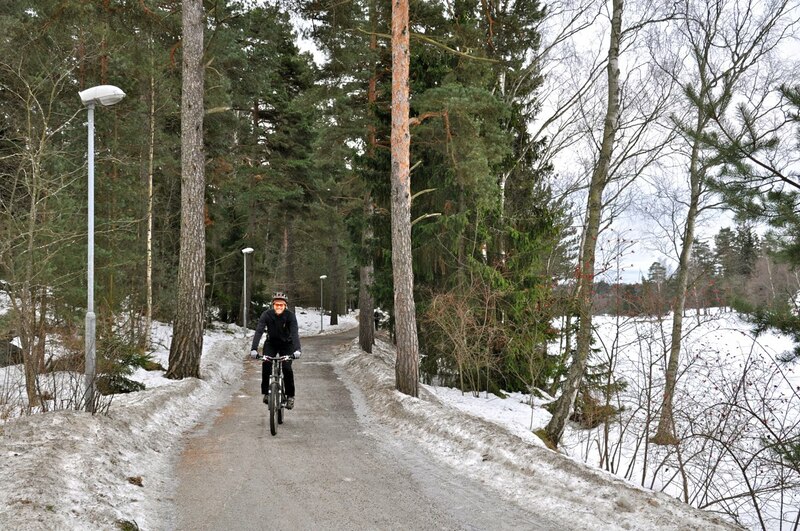 I had a major awakening in mid-October when I was riding my mountain bike to the Nacka nature reserve. Bikes aren’t allowed on trains or buses in the city, so I rode from my apartment in the north to the trails in the south, about a 50 minute trip. Riding my own bike through the city was so much more fun and faster than riding the generic city bike that it reignited my desire to get a bike for commuting. Even now in winter, bike lanes are all plowed, rocked (they use pea gravel instead of sand, much more bike friendly) and lit with the same consideration as roads. So if all goes well, next fall I’ll be able to get my own commuter and become fully self-propelled! It's become clear the main ingredient to making bicycle commuting accessible is the infrastructure. So many of the roads here have been built to handle every type of traffic, which really makes riding in the city fun. Back home in Michigan, I try to ride legally on the roads in town, but they are so crowded with cars as it is that I feel like I’m interrupting traffic, and sometimes drivers let me know I’m interrupting so I feel even more anxious and unsafe. If cities really want to promote cycling, the infrastructure has to be in place so bikers know where they are safe to go and drivers know where bikers will be. 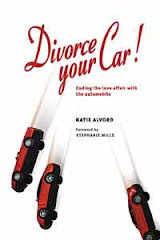 While I know the name of the game here is “divorce your car,” I’ve learned that cars aren’t always a necessary evil, but a necessary tool. As the book itself points out, there are ways to fit cars optimally into the transportation mix. I’ve recently started understanding how that can work, so next time I will discuss Stockholm and its cars. All of them, not just the Volvos and Saabs.